Don't miss this opportunity to own this Gorgeous 5 bedroom including 2 master suites. Truly a Unique home design in non-gated neighborhood! Offering over 3, 000sf of living space, this 5 bedroom home has plenty of room for the entire family and features volume & cathedral ceilings, screened front entryway, elegant floor plan with columns in front sitting room/foyer area, tile flooring throughout, spacious kitchen, formal dining area & breakfast nook, a massive second master suite on second floor with a large walk-in closet & full bath, split bedroom floor plan, an extended screened rear lanai with tile flooring, 2-car garage with screen door, and a completely fenced-in rear yard with shed. There is enough room to add a pool, and there is already a pool bath in place. 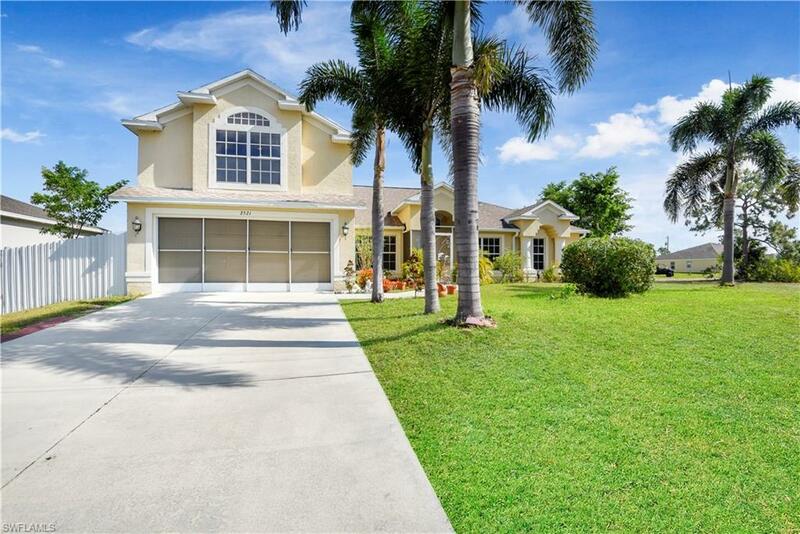 Situated on a paved road in a growing area of NW Cape Coral and surrounded by custom built single family homes- North of Pine Island Rd and just East of Burnt Store Rd N.